There are multiple existing and emerging therapeutic avenues for metastatic prostate cancer, with a common denominator, which is the need for predictive biomarkers. Circulating tumor DNA (ctDNA) has the potential to cost-efficiently accelerate precision medicine trials to improve clinical efficacy and diminish costs and toxicity. However, comprehensive ctDNA profiling in metastatic prostate cancer to date has been limited. A combination of targeted and low-pass whole genome sequencing was performed on plasma cell-free DNA and matched white blood cell germline DNA in 364 blood samples from 217 metastatic prostate cancer patients. ctDNA was detected in 85.9% of baseline samples, correlated to line of therapy and was mirrored by circulating tumor cell enumeration of synchronous blood samples. Comprehensive profiling of the androgen receptor (AR) revealed a continuous increase in the fraction of patients with intra-AR structural variation, from 15.4% during first-line metastatic castration-resistant prostate cancer therapy to 45.2% in fourth line, indicating a continuous evolution of AR during the course of the disease. Patients displayed frequent alterations in DNA repair deficiency genes (18.0%). 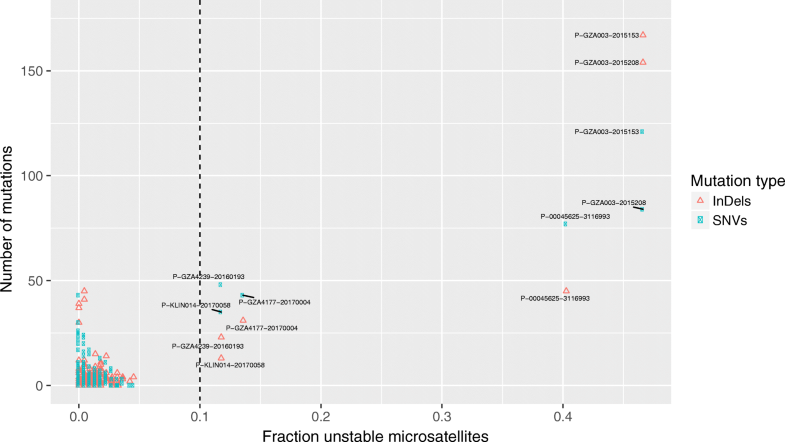 Additionally, the microsatellite instability phenotype was identified in 3.81% of eligible samples (≥ 0.1 ctDNA fraction). 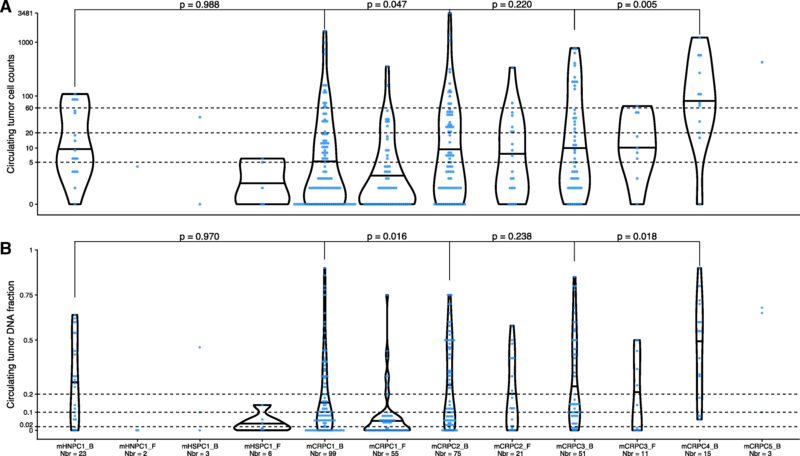 Sequencing of non-repetitive intronic and exonic regions of PTEN, RB1, and TP53 detected biallelic inactivation in 47.5%, 20.3%, and 44.1% of samples with ≥ 0.2 ctDNA fraction, respectively. Only one patient carried a clonal high-impact variant without a detectable second hit. 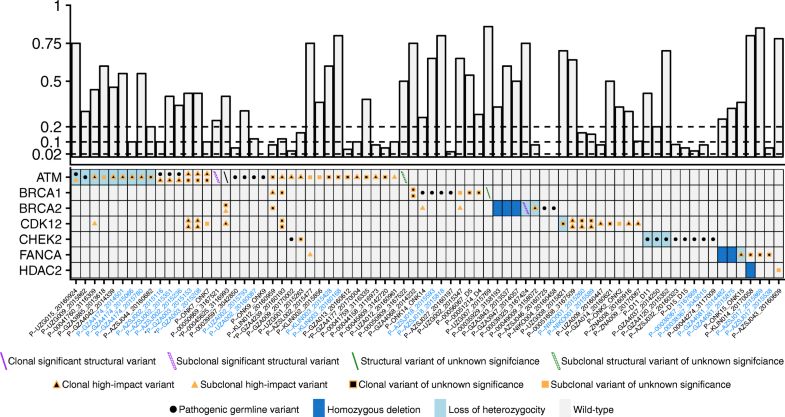 Intronic high-impact structural variation was twice as common as exonic mutations in PTEN and RB1. Finally, 14.6% of patients presented false positive variants due to clonal hematopoiesis, commonly ignored in commercially available assays. ctDNA profiles appear to mirror the genomic landscape of metastatic prostate cancer tissue and may cost-efficiently provide somatic information in clinical trials designed to identify predictive biomarkers. However, intronic sequencing of the interrogated tumor suppressors challenges the ubiquitous focus on coding regions and is vital, together with profiling of synchronous white blood cells, to minimize erroneous assignments which in turn may confound results and impede true associations in clinical trials. Prostate cancer is the most commonly detected male cancer in Europe and the third major cause of cancer-related death among men . Although the majority of metastatic hormone-naïve prostate cancers (mHNPCs) demonstrate a reliable response to initial androgen deprivation therapy which targets AR signaling, progression to a castration-resistant state is inevitable. However, the treatment landscape for metastatic castration-resistant prostate cancer (mCRPC) is evolving with the recent approval of several new drugs translating to an increased overall survival [2–6]. Multiple additional avenues exist as genomic profiling of metastatic tissue revealed that the majority of mCRPC patients harbor clinically relevant alterations beyond the AR signaling pathway . The most promising non-approved treatment avenue in metastatic prostate cancers (mPCs) exploits synthetic lethality in treating homologous recombination-deficient cancers with poly (ADP-ribose) polymerase (PARP) inhibitors . Approximately one fifth of mCRPC carry mutations in DNA repair genes . However, the mutational signatures of biallelic inactivation are heterogeneous between different DNA repair genes , and future studies are therefore needed to determine which genes are associated with a response to PARP inhibition. Approximately 3% of mPC are driven by microsatellite instability (MSI) [7, 10]. Pembrolizumab recently became the first drug to be approved by the U.S. Food and Drug Administration based on the MSI phenotype, irrespective of tumor type . Although checkpoint blockade did not confer a survival advantage as compared with placebo for chemotherapy-relapsed mCRPC , anecdotal cases have been reported to display partial or complete responses [10, 13–15]. The emergence of additional drugs, both towards common and rare mPC phenotypes such as PTEN-deficient [16, 17] and neuroendocrine cancers , raises questions of how to efficiently translate the multitude of treatment options to improved patient outcomes. The genomic heterogeneity of mCRPC  and, in turn, the low response rates of currently approved drugs [2–5, 19, 20] argue for the urgent need of predictive biomarkers. Ineffective trial-and-error decisions inevitably lead to unnecessary side effects and unsustainable costs . The AR splice variant 7 (AR-V7)  demonstrated promising results as a negative response biomarker for androgen receptor signaling inhibitors. However, follow-up studies have been unable to validate the initial clear-cut finding [23, 24], and although AR-V7 is clearly prognostic, clinical implementation remains debated due to (1) lack of treatment options for AR-V7-positive patients and (2) lack of data from a prospective clinical trial demonstrating the predictive power of AR-V7 for treatment selection . Recently, Scher and colleagues demonstrated increased survival for AR-V7-positive patients receiving taxanes in a blinded retrospective multicenter study . However, AR-V7 assay positivity and taxane therapy were both correlated to tumor burden, obscuring interpretation and further highlighting the need for a prospective randomized clinical trial to determine if AR-V7 can be applied as a predictive biomarker . The lack of predictive biomarkers is in part due to the difficulty of obtaining temporally matched metastatic tissue as the majority of mPCs metastasize to the bone. Multiple studies on the acquisition of tumor tissue with or without direct image guidance report a range of success rates [28–31]. A recent effort, focusing on methodological improvements, obtained > 20% cell content in the majority of bone biopsies . Circulating tumor DNA is a viable alternative to metastatic tissue with demonstrated high fractions of ctDNA [33–36] enabling sensitive detection of somatic variation, and direct comparisons to metastatic tissue have revealed high concordance [33, 37, 38]. Circulating tumor DNA has several advantages as sampling through simple blood draws is fast, cost efficient, and without side effects and allows for longitudinal monitoring and the detection of multiple resistance alleles during therapy [38, 39]. Although ctDNA has the potential to accelerate biomarker-driven trials in mPC, several questions remain unanswered, e.g. if it is possible to detect MSI directly from liquid biopsies and how ctDNA fractions correlate to line of therapy. The ctDNA fraction determines the sensitivity to detect somatic variation which in turn has consequences for the design of prospective biomarker studies relying on liquid biopsies. Here, we present a retrospective analysis of 217 cases and 364 blood samples covering the entire spectrum of mPC. The purpose of this study was to gather information relevant for future liquid biopsy-driven biomarker studies with a focus on (1) how ctDNA fractions vary from mHNPC to end stage castration-resistant disease; (2) a rationale for how to treat samples with low ctDNA fraction; (3) the relative impact of different types of somatic variation, affecting the sequencing strategy; (4) the detection of potentially predictive biomarkers; (5) and finally, how clonal expansions in the hematopoietic stem cells [40–43] impact liquid biopsy profiling. A detailed description of the methods is provided in Additional file 1: Supplemental methods. In brief, mPC patients were recruited in an all-comer cohort (n = 217), ranging from hormone-naïve to castration-resistant, between 2014 and 2017 with histologically confirmed prostate adenocarcinoma (Table 1). Blood samples (n = 364) were collected at the start of a new line of therapy (defined as “baseline” sample) or during a particular systemic therapy (defined as “follow-up” sample). The complete study cohort (n = 217) encompassed patients recruited as part of the ProBio (Prostate Biomarkers) study (n = 72, Stockholm, Sweden) and abiraterone- or enzalutamide-treated patients (n = 145) recruited to the CORE-ARV-CTC study (Antwerp, Belgium). The original purpose of the CORE-ARV-CTC cohort was to investigate if profiling androgen receptor splice variants in circulating tumor cells (CTCs) may predict response to enzalutamide and abiraterone treatment. The result of this analysis together with somatic alterations in AR and TP53 is presented in a separate manuscript . Additionally, anonymous healthy donor blood (n = 36) was collected (Stockholm, Sweden). The study was conducted in accordance with the Declaration of Helsinki, after approval was acquired by ethical committees in Belgium (Antwerp University Hospital, registration number: B300201524217) and Sweden (Karolinska University Hospital, registration number: 2016/101-32). All patients provided a written informed consent document. Plasma was enriched from 2 × 10 ml (ProBio patients) or 4–5 ml (CORE-ARV-CTC patients) EDTA blood and stored at − 80 °C within the same working day, allowing for high-quality ctDNA profiling . Germline DNA was extracted from leftover EDTA blood. In addition, for 340 out of 364 ctDNA-analyzed blood samples, an additional blood sample was collected in a CellSave tube and shipped to the GZA Sint-Augustinus (Antwerp, Belgium) for CTC enumeration within 72 h on the FDA-cleared CellSearch platform (Menarini Silicon Biosystems, Italy), as previously described . Upon isolation, 0.1–50 ng of cell-free DNA (cfDNA) and 50 ng of germline DNA were used to create the sequencing libraries (ThruPLEX Plasma-seq kit, Rubicon Genomics, USA). Cell-free DNA profiling was performed with a mix of low-pass whole genome sequencing and hybridization-capture targeted sequencing (SeqCap EZ system, Roche Nimblegen, USA). Germline samples were only processed by the latter. The capture designs and their targeted regions are described in Additional file 2: Table S1. Low-level processing of the sequencing data was performed as previously described  and analyzed as described in detail in Additional file 1: Supplemental methods, which allowed for identification of pathogenic germline variants, copy-number alterations (CNAs), small mutations, and structural variation in unique regions in the human genome commonly mutated in prostate cancer (bioinformatic tools and settings are summarized in Additional file 3: Table S2). The detection of somatic alterations, which was copy-number adjusted, allowed the estimation of tumor burden (ctDNA fraction, the fraction of cfDNA molecules originating from the cancer cells). Where somatic CNA analysis suggested a higher tumor burden, it was instead calculated from the CNA profile. Additionally, the incorporation of microsatellites in the comprehensive capture design allowed the evaluation of microsatellite instability (MSI). Finally, the analysis of patient-matched cfDNA and germline DNA samples, compared to a merged file of all healthy donor blood samples as a control, allowed the interrogation of clonal hematopoiesis. Statistical analysis was performed in R (v3.3.2) . Comprehensive cfDNA profiling was performed on 217 mPC patients (Table 1). Single nucleotide variants, copy-number alterations (CNAs), and genomic structural rearrangements were interrogated using a combination of in-solution hybridization capture-based and low-pass whole genome sequencing. An evolution of capture designs was applied as the project progressed, from a pan-cancer to a prostate-specific approach to cost-efficiently maximize the information content (Additional file 2: Table S1). The comprehensive designs were aimed at progression samples with high tumor burden whereas the smaller designs were tailored for cost-efficient deep sequencing. However, to increase the sensitivity to detect, e.g., intronic structural variation in AR, the majority of samples were processed with both a comprehensive and a smaller design (Additional file 4: Table S3). The data was subsequently merged before variant calling. The average coverage, taking merging into account, was 814× (interquartile range 251–965) for cfDNA and 445× (interquartile range 371–533) for germline DNA. Data from all samples is presented here, where the number of relevant samples is described for each section (Additional file 5: Table S4). In total, 364 plasma samples from 217 mPC patients were profiled. Circulating tumor cell enumeration using the CellSearch platform was performed from synchronous blood draws on 340 of the 364 plasma samples. Circulating tumor DNA was detected in the majority of baseline samples (85.9%, Additional file 6: Figure S1). However, as the fraction of ctDNA in the cfDNA influences the sensitivity to detect somatic variation, we investigated if tumor burden correlated to line of therapy and blood draw timing (Additional file 7: Table S5). Comparing baseline ctDNA fractions at different lines of therapy, a significant increase was present between first- and second-line mCRPC and third- and fourth-line mCRPC (Fig. 1). The ctDNA fractions were significantly lower, comparing baseline and follow-up samples for mHNPC and first-line mCRPC (Additional file 6: Figure S2). The differences were not statistically significant for later lines of therapy. The CTC counts were correlated to the ctDNA fraction estimate (rho = 0.7, p < 0.0001) (Additional file 6: Figure S3) and mimicked the ctDNA pattern in relation to line of therapy (Fig. 1, Additional file 6: Figure S2). Microsatellites were targeted and sequenced to enable MSI-phenotype detection directly from cfDNA (Additional file 2: Table S1 and Additional file 5: Table S4). Using an in-house cohort of colorectal cancer samples (Additional file 6: Figure S4), in silico dilution with germline DNA demonstrated 100% sensitivity and 99% specificity to detect MSI at 10% tumor purity and 10% unstable microsatellites with the mSINGS algorithm . Applying mSINGS on ≥ 10% ctDNA fraction samples identified four cases with MSI out of 105 investigated (Fig. 2). The proportion of MSI-positive cases detected from ctDNA is concordant with a previous study based on whole-exome sequencing of metastatic tissue samples (two-sided Fisher’s exact test: p = 0.721) . Prostate cancer is mainly driven by CNAs, commonly generated through chained structural rearrangements. Chained events cause the majority of TMPRSS2-ERG gene fusions , also observed in our data (Fig. 3, Additional file 6: Figure S5). To allow detection of structural rearrangements, capture probes were designed towards the non-repetitive intronic and exonic regions of PTEN, RB1, and TP53 in the prostate-specific comprehensive design (CP design, Additional file 2: Table S1, Additional file 5: Table S4, Additional file 8: Table S6, Additional file 6: Figure S6). Structural rearrangements, mutations, and copy-number alterations were investigated in 165 cfDNA samples from 135 study participants profiled with the CP design that passed the internal quality control for structural variant calling (Additional file 1: Supplemental methods, Additional file 5: Table S4). Seventy-one samples (71/165, 43.0%) from 59 men (59/135, 43.7%) had a ctDNA fraction ≥ 0.2, where all classes of somatic variation were detectable. Biallelic inactivation, through clonal high-impact variation, occurred in 47.5% (28/59), 20.3% (12/59), and 44.1% (26/59) of patients in PTEN, RB1, and TP53, respectively. After excluding the MSI samples (carrying high-impact passenger mutations in multiple genes), all samples with a clonal high-impact variant also harbored a second event with only one exception: two samples were profiled for patient P-00030277 and both revealed a 392-kb deletion encompassing exon 9–10 of TP53 without any observable second hit. 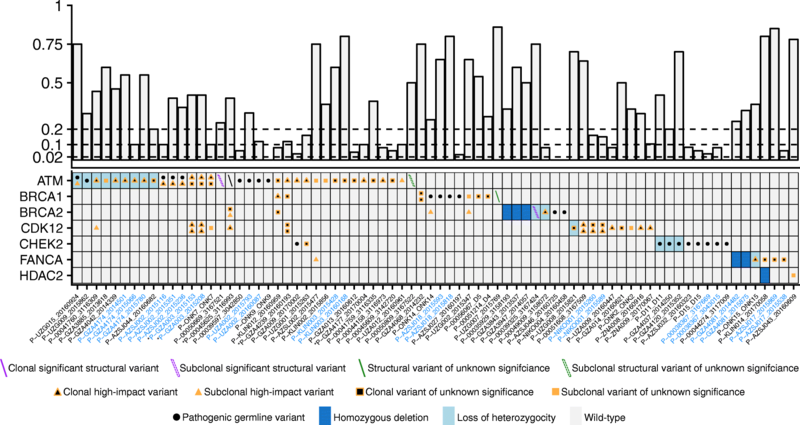 Subclonal high-impact variation was detected in multiple patients. Both samples of P-GZA006 revealed subclonal TP53 mutation accompanied by subclonal deletion (Fig. 3). Before the start of abiraterone therapy, sample 20160759 of patient P-GZA4777 carried two subclonal TP53 mutations (hotspot and frameshift), a subclonal translocation in PTEN, and a weak AR amplification (Additional file 6: Figure S7A). At progression (sample 20160890), the hotspot TP53 variant, PTEN translocation and the AR amplification were undetectable. However, the TP53 frameshift increased in allele fraction and a new structural deletion in TP53 was found, in line with TP53 loss being associated with rapid progression . P-KLIN003 also experienced change in clonal composition during abiraterone therapy (Additional file 6: Figure S7B). At baseline, two TP53 mutations were detected. After therapy, the two displayed different behavior, decreasing and increasing in allele fraction. The progressing clone also presented with TP53 loss of heterozygosity and multiple structural variants in AR. Patient P-00039325 had high ctDNA fraction despite being on androgen deprivation therapy for 3 weeks. Following docetaxel treatment, P-00039325 progressed after 215 days with a translocation in BRCA2 and concomitant loss of heterozygosity (Additional file 6: Figure S7C). In addition, an AR amplification and intra-AR structural variation were detected. Comprehensive profiling of AR, including intronic sequencing, was performed in 275 mCRPC plasma samples from 177 individuals (Fig. 4a, Additional file 5: Table S4). In total, 45.8% (126/275) of the samples and 50.3% (89/177) of the patients harbored one or more variants in AR (high-impact mutation, structural variant, or amplification) in at least one cfDNA sample (Additional file 8: Table S6). Intra-AR structural variation was closely correlated to amplification, and only 3/51 patients (P-GZA4045, P-GZA4120, P-U001) carried intra-AR structural variation without an accompanying amplification. Structural variation was detected in another three patient samples without amplification (P-AZSJ022, P-KLIN002, P-UZA002), but weak amplifications were found in other samples from the same individuals, taken at other occasions. The fraction of patients with structural variation in AR correlated to line of therapy, ranging from 15.4% during first-line mCRPC therapy to 45.2% in the fourth line. Overall, the percentage of individuals with any alteration in AR increased from 37.4% in the first line to 76.9% in the fourth line, indicating a continuous evolution of AR during the course of the disease (Fig. 4b). Genes associated with DNA repair deficiency and commonly mutated in prostate cancer were targeted for mutations and deletions (Additional file 2: Table S1). Sequencing of germline DNA revealed high-impact variants in 8.92% (ATM, BRCA1, BRCA2, and CHEK2), similar to recent reports [50–52]. However, only 2/213 (excluding four germline DNA samples that failed processing) carried pathogenic BRCA2 mutations, significantly less than Pritchard et al. and Mandelker et al. (two-sided Fisher’s exact test: p = 0.00329, p = 0.00129, respectively; Additional file 9: Table S7). Both reported multiple occurrences of Ashkenazi Jewish founder mutations such as the BRCA2 p.Ser1982Argfs*22, not observed in this report. Coverage was manually inspected using the integrative genomics viewer  which excluded technical causes. This suggests differences in the underlying population demographics. Excluding MSI-positive cases, 18 (8.29%) individuals had somatic biallelic inactivation of a DNA repair gene, whereas 39 (18.0%) had one detectable alteration (Fig. 5, Additional file 8: Table S6). Note, however, that the intronic regions were not targeted in the current version of these capture designs rendering structural variation undetectable, except close to exons or baits designed for CNA purposes. 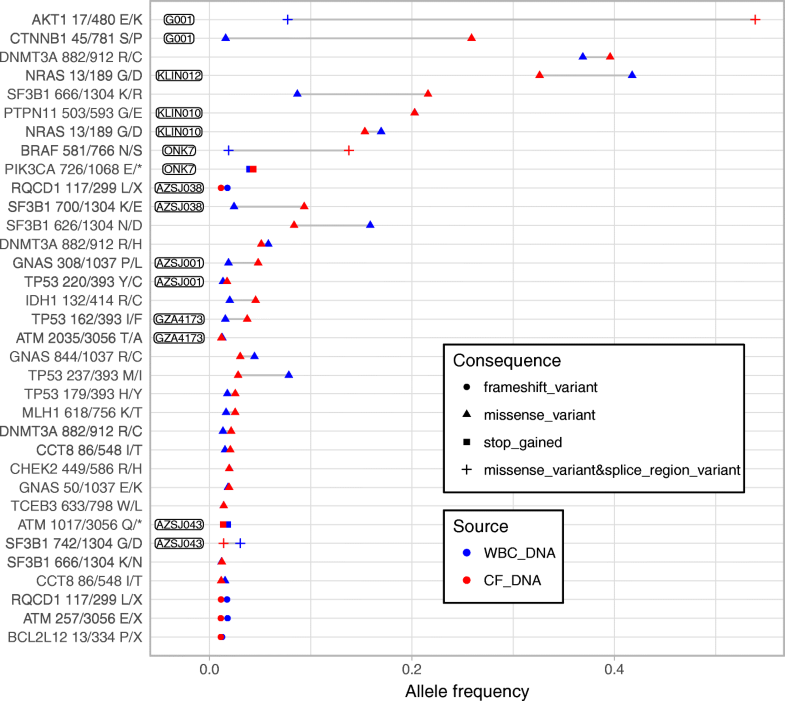 Aberrant blood cell populations [40–43] have the potential to confound ctDNA mutational profiles when performed without matched blood DNA as a control. To assess the potential impact and prevalence of genetically aberrant blood cell expansions in our cohort, we investigated copy-number and mutational data for indications of aberrations present in both cfDNA and white blood cell (WBC) DNA. We observed, in separate patients, four cases of large arm-level copy-number alteration (chr 11, 13, and 20) in WBC with coverage ratio and single nucleotide polymorphism allele ratio suggesting a cellularity between 40 and 65% and a focal CCND1 amplification with coverage ratio 1.57, and all were similarly observed in the cfDNA. Putative hematopoietic somatic point mutations were interrogated in WBC DNA using pooled healthy donor DNA as control and excluding variants exceeding 25% allele ratio and outside known somatic hotspots as likely germline. Thirty-seven protein-altering variants were observed in another 29 patients and could be validated in patient-matched cfDNA, including hotspot mutations in AKT1, BRAF, CTNNB1, DNMT3A, NRAS, SF3B1, and TP53 (Fig. 6). In summary, 40 false positive variants in 31 patients (14.6%) would have been included in ctDNA mutational profiles if matched WBC had not also been sequenced. Genomics-guided therapy selection is arguably the most promising avenue to remedy trial-and-error treatment decisions and the accelerating costs of drugs . However, the utility of tumor profiling is currently limited in mPC due to the lack of validated predictive biomarkers. Liquid biopsies have the potential to act as a tissue substitute and cost-efficiently accelerate trials designed to identify predictive biomarkers. Therefore, we set out to comprehensively profile cfDNA samples in mPC, encompassing mHNPC to mCRPC, to gain knowledge relevant for applying ctDNA in a clinical trial context. Although this study was not designed as a predictive or prognostic biomarker study, our data represents a valuable resource for the mPC ctDNA field. We demonstrate the capability of ctDNA-based analysis, but at the same time highlight the challenges which include, but are not limited to, performing analysis where the somatic alterations may originate from multiple independent sources and ctDNA fraction may be low. In addition, we addressed several unanswered research questions of which the key findings are as follows: (1) ctDNA fractions increased gradually from the first to fourth line of therapy. Baseline samples had higher ctDNA fraction compared to follow-up samples, but the difference became non-significant after the second line of mCRPC therapy; (2) in samples with high tumor burden, inactivation of key tumor suppressors was biallelic rather than monoallelic, with only one exception, providing a rationale for assuming a second hit in low ctDNA fraction samples with insufficient sensitivity to detect the second hit; (3) clonal high-impact structural variation is twice as common as point mutations, which challenges the traditional focus on coding regions; (4) the three potentially clinically valuable biomarkers in mPC, microsatellite instability, mutations in genes associated with DNA repair deficiency and AR aberrations were detected at expected rates; (5) clonal hematopoiesis occurs frequently, demanding synchronous WBC profiling to avoid false positive variant calls. Due to the genomic diversity of metastatic cancer, resistance will always arise to single-agent therapies where the duration of response is correlated to the number of cancer cells in a patient . Towards end-stage disease, progression will occur more rapidly, regardless of therapy, with the exception of extreme responders to immunomodulators . Molecular biomarker-driven clinical trials are commonly targeting patients where no approved treatment options remain, although primary outcomes may be hard to achieve if disease burden is too high . Consequently, tumor burden as ctDNA fraction or CTC counts is strongly correlated to conventional outcome measurements [49, 56]. Recently, simple cfDNA concentration estimates were demonstrated to prognosticate patients in a retrospective analysis of two phase III clinical trials . Here, cfDNA concentration was strongly correlated to ctDNA fraction (Additional file 6: Figure S8) suggesting that cfDNA concentration estimation is a surrogate for ctDNA fraction. Tailored treatment, based on tumor profiling, therefore has the greatest potential early in the course of the disease. Paradoxically, we find that liquid biopsies carry more information towards end-stage disease and currently harbor limited information in a significant fraction of patients starting first- and second-line mCRPC therapy due to low ctDNA fraction (Fig. 1). The tumor burden increased with new systemic (baseline) treatments, from the first to second line and third to fourth. We could not detect a significant difference between second and third baseline samples, likely reflecting the heterogeneity of the treatment sequencing and responses in this all-comers cohort. Comparing the baseline samples, the fraction where it was possible to identify homozygous deletions increased steadily from one third (33/99, before start of first systemic mCRPC treatment) to approximately 50% (59/126, before start of second/third systemic mCRPC treatments) and finally to more than two thirds (11/15, before start of fourth systemic mCRPC treatment). As a consequence, the fraction of patients with BRCA2 homozygous deletion detected here (1.38%, 3/217) was lower than previously reported from two studies analyzing tumor tissue from metastatic patients (2.67%, 4/150 and 4.54%, 5/110) [7, 58]. However, the difference was not statistically significant (two-sided Fisher’s exact test: p = 0.450 and p = 0.124, respectively). A potential solution for the low ctDNA fraction samples may be a complementary approach using CTCs to gain insight into ploidy and CNA and ctDNA for mutations and structural rearrangements. However, there are some limitations: we show that CTC counts correlate with ctDNA fraction (Additional file 6: Figure S3), and patients with low ctDNA fraction starting first- and second-line mCRPC therapy, with few exceptions, have low CTC counts (Additional file 6: Figure S9); previous work demonstrates poor success rate (~ 10%) in obtaining high-quality CTC sequencing data from isolated cells [59, 60] necessitating multiple 10-ml blood tubes for CTC analysis in first- and second-line patients. However, recent improvements in harvesting metastatic tissue  may provide a fallback if ctDNA profiling fails to identify any relevant biomarkers. As the success rate of harvesting high-quality metastatic tissue is also correlated to tumor burden [29, 30], prospective validation is needed to establish the most feasible approach. The inherent challenges to complement ctDNA profiling inspired us to investigate the necessity of observing a second hit to infer tumor suppressor deficiency. By deep sequencing of all non-repetitive intronic and exonic regions in TP53, PTEN, and RB1 in high ctDNA fraction samples, we investigated whether detection of one clonal high-impact variant is adequate to infer biallelic inactivation. Out of 71 samples in 59 men with ≥ 0.2 ctDNA fraction, 47.5%, 20.3%, and 44.1% harbored biallelic inactivation of PTEN, RB1, and TP53, respectively (Fig. 3). Only one patient carried a clonal high-impact variant, a deletion in TP53, without a detectable event on the other allele. These data are encouraging as a large fraction of TP53 was not possible to sequence due to repetitive DNA (Additional file 6: Figure S6). The observation is consistent with exome sequencing of 150 mCRPC tissues which revealed that biallelic inactivation always had occurred if a high-impact event was observed in a key tumor suppressor such as PTEN or RB1 . Interestingly, residual breakpoints remained in 5/17 samples with a homozygous deletion in PTEN, which is detectable, even when tumor burden is low. The comprehensive profiling of AR surprisingly revealed that 11 out of 85 amplified mCRPC cfDNA samples harbored hotspot mutations in AR. However, concomitant presence of amplification and mutations in a low fraction of cases has previously been described [34, 49]. Speculatively, the multiple existing therapies towards the AR signaling pathway will exert selection pressure differently. This will lead to a complex AR phenotype, where for example an amplified AR is first detectable after first-line androgen deprivation therapy. Subsequent abiraterone treatment may give rise to specific point mutations causing the simultaneous presence of both mutations and amplifications in AR. These speculations are supported by recently published data  demonstrating that AR amplifications are not prognostic in the context of abiraterone or enzalutamide treatment, causing a selective pressure on other AR and non-AR alterations as a consequence of therapy. The advances in targeted sequencing of cancer have rapidly been adopted by multiple companies and transformed into commercially available ctDNA tests [61–63]. Two of these platforms were recently compared with surprisingly low concordance . The lack of accompanying white blood cell germline profiling makes it hard to separate germline variation from somatic  and impossible to distinguish clonal hematopoiesis [40–43] from ctDNA unless the ctDNA fraction is high with distinct features of the disease, e.g., the TMPRSS2-ERG gene fusion. In our study, 14.6% of patients harbored clonal expansions in the WBC compartment. Their somatic alterations, detected in germline DNA, were validated in cfDNA from the same individual. However, absolute confirmation of the cell of origin for clonal hematopoiesis events would require investigations involving fluorescence-activated cell sorting of the WBC populations followed by Sanger sequencing or preferably single-cell sequencing, which is beyond the scope of this study. As the targeted sequencing applied here only covered 60 out of 327 driver mutations associated with clonal expansions in the blood , the majority of men with mCRPC probably suffer from clonal hematopoiesis. A recent report used digital droplet PCR to investigate hotspot mutations in three genes, commonly mutated in hematopoietic malignancies, in WBC DNA from patients previously profiled with a commercial cfDNA assay . A large fraction of the mutations was detected in the WBC DNA, corroborating our conclusions that to avoid false positive variant calls, sequencing of WBC DNA should be undertaken to the same or higher depth as the cell-free DNA. We therefore discourage the use of commercial assays that only analyze cfDNA from plasma. Although multiple potentially predictive biomarkers have been reported for metastatic prostate cancer, no level 1 evidence currently exists from prospective randomized clinical trials. Based on our experience to date, we consider ctDNA profiling to be at Technology Readiness Level 7 according to the definition applied in the Horizon 2020 calls . We have therefore initiated a prospective outcome-adaptive, multi-arm, open-label, multiple-assignment randomized biomarker-driven trial in patients with mCRPC where ctDNA profiling will be applied to identify somatic alterations (ProBio, EudraCT Number 2018-002350-78). The goal of the trial is to determine whether treatment choice based on a biomarker signature can improve progression-free survival compared to standard of care in patients with mCRPC and to evaluate the predictive capability of the investigated biomarker signatures. This study strengthens the accumulating evidence that ctDNA profiling mirrors the somatic alteration landscape from metastatic tissue by demonstrating, for the first time, that the MSI phenotype may be detected directly from cell-free DNA. To enable acceleration of clinical trials through ctDNA analysis, intronic sequencing of tumor suppressors in combination with synchronous profiling of white blood cells must be applied to prevent inaccurate somatic variant calls, which in turn may reduce the power to identify predictive biomarkers. Markus Mayrhofer and Bram De Laere contributed equally to this work. The authors thank all patients for their willingness to participate in this study. We thank Luc De Laere, Thijs Develter, Sophie Vantieghem, Sofie Herman, Gwen Colfs, Veerle Lamotte, Anita Boumans, Abdelbari Baitar, Roos Haeck, Goele Wallays, Hanna Emanuelsson, Per Gustafsson, Jenny Wängberg, Maria Bergh, and Claudia Maes for their assistance with patient inclusion, sampling management, and data collection. We also thank Rebecka Bergström for excellent bioinformatic support. The Belgian Foundation Against Cancer (grant number C/2014/227); Kom op tegen Kanker (Stand up to Cancer), the Flemish Cancer Society (grant number 00000000116000000206); Royal College of Surgeons/Cancer Research UK (C19198/A1533); The Cancer Research Funds of Radiumhemmet, through the PCM program at KI (grant number 163012); The Erling-Persson family foundation (grant number 4-2689-2016); the Swedish Research Council (grant number K2010-70X-20430-04-3), and the Swedish Cancer Foundation (grant number 09-0677). These funding bodies had no role in the design, execution, or interpretation of the data in this study and did not influence the decision to submit results for publication. All data relevant for the interpretation of our findings is provided in the main manuscript or the supplemental information except for the raw sequence data. Any data providing genotype information is considered to be a personal registry by the Swedish law (Personal Data Act), thereby prohibiting the submission to a public repository. The raw sequence data is instead available upon request from the authors (contact johan.lindberg@ki.se) if approval has been obtained from the Regional Ethical Vetting Board in Stockholm. BDL, PR, JL, and HG conceived the study and designed the methodologies and experiments. BDL, SO, JL, and GVdE performed experiments and acquired data. BDL, MM, TW, JL, and MR analysed and interpreted the data. PVO, CG, JA, PO, WD, LH, DS, BB, WL, EE, DDM, MS, KF, AR, AU, JY, HG, TN, MA, PR, and LD recruited patients and acquired blood samples for analysis. BDL, PR, JL, MM, and HG prepared the manuscript. BDL, PR, SO, MM, LE, TW, PJvD, PVO, CG, JA, PO, WD, LH, DS, BB, WL, EE, DDM, MS, KF, AB, DG, LH, GVdE, AR, MR, AU, JY, HG, SVL, JL, and LD performed critical revision of the manuscript for important intellectual content. All authors read and approved the final manuscript. Ethical approval was obtained from ethical committees in Belgium (Antwerp University Hospital, registration number: B300201524217) and Sweden (Stockholm Regional Ethical Vetting Board registration numbers: 2016/101-32, amendment 2017/252-32; 2009/780-31/4, amendment 2014/1564-32). All patients provided a written informed consent document. The study was conducted in accordance with the Declaration of Helsinki. All patients additionally consented to have their data published in an anonymous format. Each patient and blood draw were assigned an untraceable number. The sample donor ID represents a unique patient and the sample ID a specific sampling occasion.